The way we grow our food has to change. Agriculture must produce more food but with fewer resources like energy and water. Hunger eradication is essential for sustainable development, and sustainable consumption and production systems are essential to eradicate hunger and protect ecosystems. 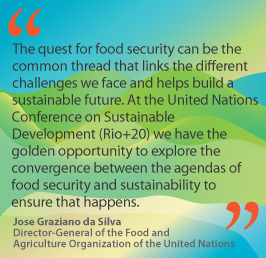 FAO at the Rio+20 conference from 13 to 22 June will participate in over 30 events that range from food security, agriculture, fisheries, forestry to nutrition, energy and water among many other crosscutting subjects that are essential when discussing sustainable development issues. Food security and good natural resource management must go hand in hand if we want to eradicate hunger and poverty to achieve the Rio vision of sustainable development. 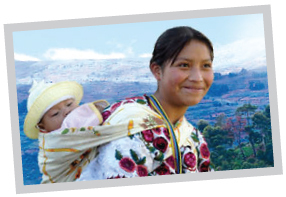 The Rio vision of sustainable development cannot be realized unless hunger and malnutrition are eradicated. The Rio vision requires that both food consumption and production systems achieve more with less. The transition to a sustainable future requires fundamental changes in the governance of food and agriculture and an equitable distribution of the transition costs and benefits.